A flange plunger is an everyday household item. It’s one of the most recognizable plumbing tools and comes in different sizes and shapes. It’s used to clear basic clogs in a toilet. The plunger creates a vacuum with every up-and-down motion. This vacuum generates a large amount of water force that's used to flush out a small clog. Note: A flange plunger is different than a cup-shaped plunger. The flange-shaped plunger is shaped to seal off the toilet hole. A plumber's snake (also known as a sink or hand auger) is the best tool for deep clogs. It's hand-cranked and works a 25-foot-long steel cable into sinks, toilets, and other drain sources to clear deep obstructions. To use it, place the steel cable into a hole of the drain source until the deep clog is located. Pull and turn the steel cable back up slightly, and repeat this motion until the deep clog loosens. If you cannot feel the clog with a plumber’s snake, it’s likely that the clog is too deep into the drainage system. 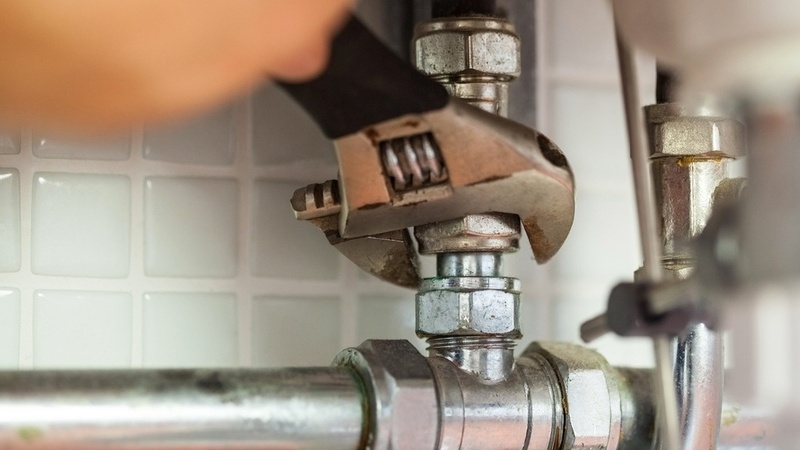 Call a professional for this minor emergency plumbing situation. An adjustable pipe wrench is another recognizable tool in an emergency plumbing kit. Adjustable wrenches vary in the size of the jaw head, shape, purpose, and handle size. The most common use for an adjustable pipe wrench is to tighten pipes. This prevents minor and major leaks in bathrooms, kitchens, laundry rooms, and basements. You can also remove and fit plumbing fixtures with this tool. Use it by tightening the wrench around a pipe using the knurled knob. Because of the serrated edges of the wrench, overall pressure increases when the wrench turns. Note: Duct tape must be used as a barrier on the pipe to prevent teeth marks when using an adjustable pipe wrench. According to Hanover Supply Co., a commercial plumbing supply store in New Jersey, this duo of "plumbing tools have adjustable heads to fit the size of the tube or pipe. [They're] used to cut...metallic and plastic equipment and should be part of your plumbing tools list." Also called a hex key or Allen wrench, a set of Allen keys removes handles on faucets in bathrooms and kitchens. With a Philips head or Allen screws holding the tool together, this set of keys is useful for big and small plumbing emergencies. It could be used for replacing a valve cartridge or washer or retightening a loose faucet handle. To complement these must-have tools for an emergency plumbing kit, throw in basic essentials. Include duct tape, rubber gloves, a flashlight, a five-gallon bucket, and putty. This completes the kit with tools that can handle any plumbing mishap. If you have an emergency, contact Warner Service in Frederick. We'll help you right away.